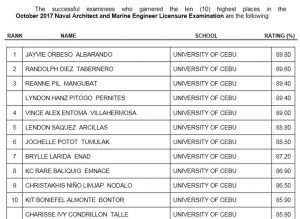 The University of Cebu produced all the top 10 examinees.of the 2017 Naval Architect and Marine Engineer Licensure Examinations. 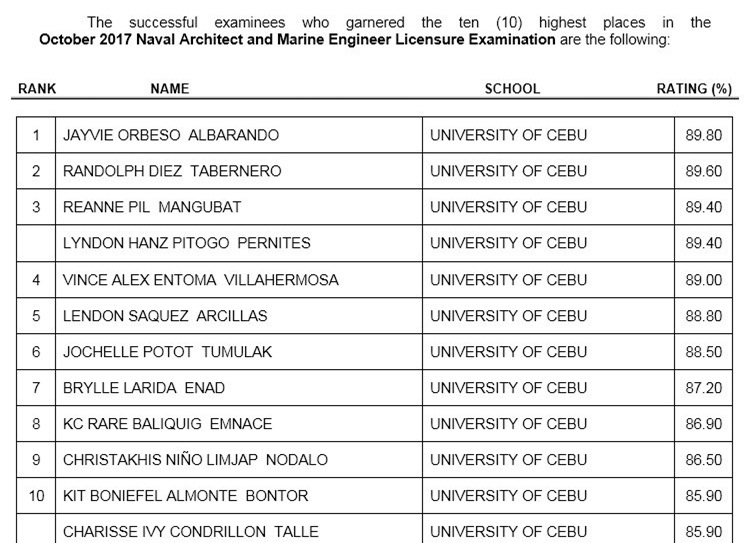 CEBU CITY — The University of Cebu (UC) on Wednesday gave out cash incentives to its 12 topnotchers in the October 2017 Naval Architecture and Marine Engineering Licensure exams. UC President Augusto Go and UC Chancellor Candice Gotianuy awarded a check of PHP100,000 to Jayvie Albarando for topping the exams with an overall rating of 89.80 percent. The 21-year-old Albarando of Barangay Lipata, Minglanilla, Cebu, said he is still in shock that he ranked No. 1. “I still couldn’t believe it,” said Albarando, adding that he was not even a consistent honor student in school. “Being on top is already a big blessing for me, but I thank the UC administration for this honor,” Albarando said in the Cebuano vernacular. The rest of the all-UC topnotchers, on the other hand, received PHP50,000 each from the university. Randolph Tabernero came in second with a rating of 89.60, Reanne Mangubat and Lyndon Hanz Pernites shared third with 89.40, and followed by Vince Alex Villahermosa and Lendon Arcillas at fourth and fifth with 89 and 88.80, respectively. Completing the Top 10 lineup are Jochelle Tumulak (88.50), Brylle Enad (87.20), KC Rare Emnace (86.90), Christakhis Niño Nodalo (86.50), and Kit Boniefel Bontor and Charisse Ivy Talle (85.90). UC Naval Architecture and Marine Engineering chairman Jacklyn Antolinao also received a PHP100,000 cash incentive, for guiding these graduates to success. Mayor Tomas Osmeña said he is proud to be a Cebuano following the Top 10 sweep of UC in the Naval Architecture and Marine Engineering exams.